For this month's "Maps Of The Month" featurette, I wish to draw your attention to maquiladora's Final Fantasy Legend II (Game Boy) maps. Years after your father disappears, you set out on a quest to find him. He apparently was part of a secret group called the Guardians, searching for 77 pieces of a goddess's statue, known as the MAGI, which can bestow power to its bearer. As you and your party collect the MAGI, you discover new worlds, and others also looking for MAGI who have evil intentions. As well, bringing all the MAGI together may bring about disaster. So why Final Fantasy Legend II? (Or "Sa-Ga2: Hiho Densetsu", if you prefer the Japanese title, as "Final Fantasy" was merely tacked on for marketing purposes.) What makes these maps noticeably, well, legendary? Well, you've got a dozen worlds, fully mapped. Every town with full shop lists. Every dungeon with all the treasures revealed. It's all you could ever want, for a map set of an awesome RPG. You even get to enter someone's body, how great is that? 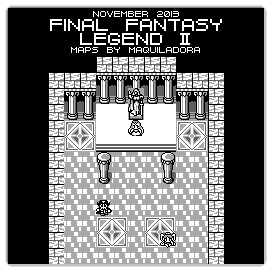 So to acknowledge the effort put into mapping a legendary handheld RPG, maquiladora's Final Fantasy Legend II (Game Boy) maps will be known as VGMaps.com's Maps Of The Month for November 2013. What I've loved about the first SaGa "trilogy" is how each game features a number of separate little worlds whose connections always fascinated me. In the first game, if you climbed the Sky Pillars and looked down from the outside of the Central Shrine, would you see every single world below you as separate little pieces of land, or as different locations on a single continuous world but separated by mountains, or are they all separate little bubbles linked solely by the Sky Pillars? I also had the same fascination with the Tower in the first SaGa game but that's not important here. Maquiladora did a great job mapping this game and he/she deserves the recognition.